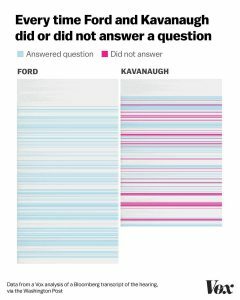 Forget the allegations of sexual misconduct, and consider what we knew of the man: he may have lied five times under oath about dirty tricks he’d helped pull, plus he’s repeatedly dodged questions about abortion rights and unnecessarily delayed a woman from getting an abortion, plus at least a hundred thousand documents were held back from scrutiny by an associate of his. That should have been disqualifying; less malfeasance than that was enough to delay his confirmation to a lower court by three years. Thursday’s hearings only turned that screw. Kavanaugh was revealed to have an angry, partisan temperament unsuitable for a judge. He spouted false conspiracy stories about Democrats and the Clinton family. He lied about his drinking habits and slang, to the point that Republican Senators had to jump in to save him. And the dodging only got worse. Kavanaugh shouldn’t hold a seat of power, let alone the most powerful one in the United States. McKay Coppins: So, you were motivated mainly by preserving institutional credibility? But Kavanaugh’s nomination wasn’t put on hold because of his misleading and possibly lie-filled testimony, nor his temperament. It was because one Senator thought there was too much partisanship, and as a secondary concern was worried Kavanaugh may have sexually assaulted someone. This only cements my argument that Republicans are not fit to govern, but more importantly it suggested a fix was in the works. Flake’s request was non-binding, so the White House and key Republicans could have ignored it; fortunately, two other Republicans joined in and made that impossible. The FBI investigation would be a background check, so it lacked subpoena power and would amount to a report dumped on a few White House and Republican desks, so maybe it’d get buried or made available only to Republicans. … the FBI cannot ask the supermarket that employed Judge for records verifying when he was employed there, one of the sources was told. Ford said in congressional testimony Thursday that those records would help her narrow the time frame of the alleged incident which she recalls happening some time in the summer of 1982 in Montgomery County, Maryland. I was half-right; since this is only a background check, the White House has a lot of control over what the FBI can do. They can prevent certain witnesses from being interviewed, continuing the he-said-she-said narrative they’re trying to push. The lack of questions about alcohol use prevent them from uncovering evidence of perjury and inadvertently triggering a criminal case against Kavanaugh. By forcing the investigation into safe waters, Republicans can claim to have done a full investigation when nothing of the sort occurred. The partisanship that Flake loathed is only going to get worse, as the FBI is made to look like the lapdog of the party in power. The fix is in, so keep up the pressure and hope you can break it up.